DJT2, "DJ Tools 2", is the second generation tool of "DJ Patterns". This application is a companion application to Virtual DJ. Uses the WinAmp playlists created by Virtual DJ, as well as other sources, and the Virtual DJ Database, an XML file, to gather and compare the media. The application is multithreaded to allow the user to cancel the process as well as view currently loaded media data while additional data is being loaded. 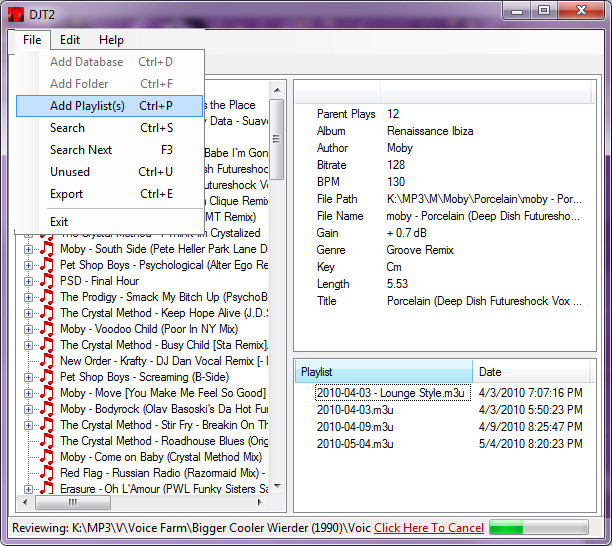 Additional detail such as Album, Genre, Key, etc are retrieved from the VDJ XML file and are displayed for the user. After the user loads media there is an option to load unused media. This asks the user for a folder to load and the application will compare media loaded into patterns and if it does not exist this media is loaded into a list below the pattern tree. The application loads all genres from the various VirtualDJ databases when the application loads. The list of genres can be used to filter media in Patterns or Export. Users can load folders, playlists and/or the VirtualDJ database (xml) into the export pane. The "status" window from "DJ Patterns" has been removed and the detail information and "cancel" is now available in the Status Bar. The loading of data was greatly improved from "DJ Patterns" by leaving the XML Document open during the entire scanning process. This change reduced the load time by more than 25%. The following fields are available for the Export section. The user can choose which fields to show and in what order. The next version will allow the user to "tag" media and filter by that data as well. This application was written in Visual Basic.NET 2008. Source is also planned to be available in C# at a later date.